Move to the hypnotic rhythms of Argentina and Brazil on this journey between neighbouring countries. Tangle yourself in cities overflowing with history, culture and a love of the good life. And discover a whole world of contrasts in between, from a laidback estancia in the Pampas to the natural spectacle of Iguazú Falls, a perfectly preserved colonial town and the art mecca of Inhotim. Day 1: Arrive Buenos Aires, Argentina. Step into a world of passion in Buenos Aires, the Paris of the South. On arrival, be met by your A&K representative you will accompany you on your private transfer to your accommodation in the heart of the Recoleta neighbourhood. Immerse yourself in the city’s many sides, from gritty La Boca and the dilapidated charm of San Telmo to the high-class hustle of Recoleta and leafy streets of Belgrano. Following time to relax, step outside your hotel, encounter the city’s European history where neo-classical mansions sit alongside bustling street markets. This morning walk in the footsteps of the First Lady of Argentina, Eva Peron. On your private tour, uncover the myths and legends of this fascinating Argentinian who helped women get the vote, founded hospitals and orphanages and helped secure labour benefits for the working class. Learn about her life and work at the Evita Museum. Take in the famous balcony, the Labour Ministry, Avenida de Mayo, Our Lady of Pilar Church and finally, the vast Recoleta Cemetery — the so-called City of Angels where Eva rests. Appreciate the afternoon at leisure or alternatively design it the way that excites you – choose from a bike tour of the city highlights, a tour of the vibrant urban street art culture, or a wine tasting in elegant Palermo. This evening, get caught in the seductive embrace of Argentina’s most sensuous dance. From the moment you enter the see-and-be-seen Phillippe Starck designed Faena Hotel, you’ll realise that Rojo Tango is not your average dinner and show. A live band and sensuous dancers will leave you breathless, while the Faena’s gastronomic offering teams aromas and textures with Argentina’s finest wines. Day 3: Buenos Aires – San Antonio de Areco. Enter the dazzling opulence of the Teatro Colon. Discover a seven-storey labyrinth of stages, chandelier-lit hallways, dressing rooms, workshops and rehearsal rooms on your behind-the-scenes tour of a building that was ranked the third best opera house in the world by National Geographic. Later, drive to the wilds of the Pampas to experience the true Argentinian countryside at Estancia La Bamba. Saddle up for a ride, laze in the outdoor pool, help the gauchos with some light farm work or simply soak up the great green canvas around you. Day 4: San Antonio de Areco. Immerse yourself in estancia life this morning. Explore the property on a horse ride, by carriage or by bike. Challenge locals to a game of bocce, Argentine style. Or simply relax on the porch, watching local life unfold around you. Later, head into the village to visit the local silversmith workshop, a tradition from the times when the gauchos carried their wealth on their belts in silver coins. Day 5: San Antonio de Areco – Buenos Aires – Iguazú Falls, Brazil. An early morning private transfer returns you to Buenos Aires airport for your flight to Puerto Iguazú. Here in this quiet town on the border of Brazil, Argentina and Paraguay, discover why the mighty Iguazú Falls is one of the New Seven Wonders of the World. Upon arrival meet your local A&K guide who will whisk you off to the national park on the Argentinian side to begin exploring this incredible UNESCO World Heritage site. Wander along the network of pathways around the endless sheath of water. Venture by train to the suspended platform at the very brink of the roaring ‘Garganta del Diablo’ waterfall (Devil’s Throat). 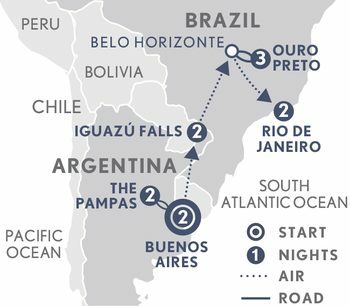 Cross the Argentina and Brazil border and continue to the only hotel located within Brazil’s Iguassu National Park, Belmond Hotel das Cataratas. Descend into the canyon and soak up the vista of some 275 falls, before taking a glass elevator back to the top. Then set off in open jeep-towed wagons, allowing an unobscured view of the scenery along the trail. Discover the flora and fauna of the park expertly shared by the knowledgeable naturalists. A short hike accessed via a stairway carved into an ancient rock, leads up to the Macuco Falls, which tumble down from a height of approximately 20 metres. Board a boat for your cruise upriver, passing through the canyon and along the rapids at a comfortable speed, allowing you to appreciate the stunning scenery. Return to your luxury accommodation and enjoy your exclusive access to this magnificent wonder when the park is closed to non-hotel guests. Witness rainbows of colour on this incredible force of nature or perhaps enjoy a champagne overlooking the falls in near solitude. Day 7: Iguazú Falls – Belo Horizonte – Ouro Preto. Head to the Iguassu Bird Park, an important rescue and conservation centre, for a behind-the scenes experience where you get up close to rare birdlife (additional cost). Continue to the airport for your flight to Belo Horizonte. Meet your local A&K guide for your private journey to Ouro Preto, in the Brazilian state of Minas Gerais. Once the richest city in the New World, Ouro Preto, which translates to “Black Gold”, is today a masterpiece of colonial Brazilian architecture, cultural heritage and art. Arrive at your accommodation, Solar do Rosario, a beautifully restored mansion. This evening your dinner reservation is at Benê da Fluta, where stories of the city’s heroes, writers and artists abound. Step back in time in this perfectly preserved 18th century town and imagine the glory of a richer, more splendid past. Everywhere you go you find yourself surrounded by astonishing beauty: the city theatre – the oldest in Brazil, magnificent colonial palaces with ornate balconies and pretty porches, mansions with colourful little shutters, baroque fountains, and enchanting little boutiques. Continue your tour to the “Enchanted City” of Mariana. Navigate the picturesque streets dotted with artist studios, intricately decorated churches and colonial gems. Lose yourself in the art wonderland of Inhotim, arguably the finest outdoor contemporary art centre in the world. Nestled in the remote southeastern town of Brumadinho, Inhotim promises a full-sensory unparalleled aesthetic experience. Spend the day exploring the sprawling 5,000 acres of lush botanical gardens, designed by Brazilian landscape artist Roberto Burle Marx, which house some 500 works by 100 artists from 30 countries. Day 10: Ouro Preto – Belo Horizonte – Rio de Janeiro. A private transfer to Belo Horizonte airport for your flight to Rio de Janeiro, where incredible contrasts of colour, lifestyles and dazzling scenery await. Drop your bags at the stunning Copacabana beachside Hotel Emiliano before taking the cable car to the summit of Sugar Loaf for the best sunset in the city. Enjoy sundowners and watch in awe as the city lights twinkle through the sea mist. Day 11: Rio de Janeiro. Step backstage to discover more about Rio’s famous Carnival. Move to the hypnotic rhythm of samba at Grande Rio’s samba school. Create your own beats in a percussion workshop. Learn about the roots of samba and the carnival. See the making of the elaborate costumes and imaginative floats, ranging from giant peacocks and pineapples to Venetian pianos and Egyptian pharaohs. Later, head to bohemian Santa Teresa neighbourhood on Morro do Desterro (Exile Hill) for a taste of Old Rio and lunch at a private estate. Take to the hills in a charming street car, seek out art studios and bars, and stop at the “Little Castle”. Day 12: Depart Rio de Janeiro. Witness one of the seven wonders of the modern world, Corcovado’s Christ the Redeemer. Gaze skywards at the sandstone figure towering 38 metres high, with arms pointing north and south, and bask in the views of the city before you. Capture this lasting image of Rio before your private transfer to the airport for your onward journey.